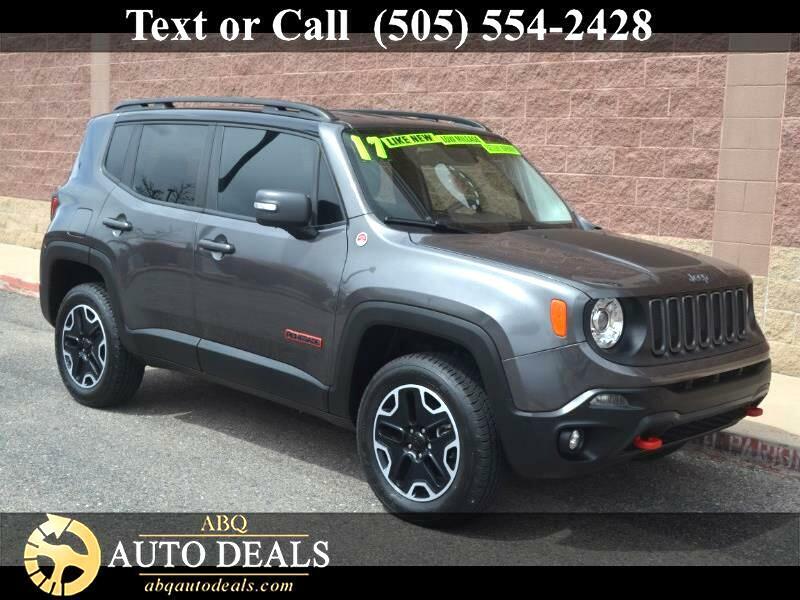 Dare to get out and push your boundaries in our adventurous One Owner, Accident Free 2017 Jeep Renegade Trailhawk 4x4 that's bold in Granite Crystal Metallic Clear Coat. Powered by a proven 2.4 Liter 4 Cylinder that provides 180hp while connected to an innovative 9 Speed Automatic transmission for passing ease. This winning Four Wheel Drive combination provides near 29mpg on the open road, and with our Selec-Terrain system with Rock mode, you can take on the toughest off-road adventures with ease. Our Renegade Trailhawk is ready to roll with an aggressive stance and fun-loving character accented by classic Jeep styling. No matter whether you're exploring new trails or out on the town, it turns heads. Check out the red tow hooks, rear lip spoiler, unique wheels, and aggressive looking black grille! The Trailhawk cabin has everything you need with supportive seating, power accessories, push-button start, air conditioning, and a leather-wrapped steering wheel with mounted controls. You'll find our Uconnect touchscreen is easy to operate and also provides hands-free calling with Bluetooth and voice commands, available satellite radio, and a media hub. Buckle up, turn on the tunes that inspire you and set off for your next great adventure. Peace of mind comes along for the ride since our Jeep Renegade Trailhawk has a reputation for safety with a rear view camera, antilock brakes, traction/stability control, airbags, blind spot monitor, and hill start assist. This is the ultimate off-roading companion you'll want to see for yourself! Print this page and call us Now... We Know You Will Enjoy Your Test Drive Towards Ownership! Your buying experience with ABQ Auto Deals is our number one priority.